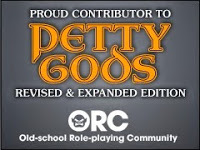 Another quick review of freebie product from Drive Thru RPG. 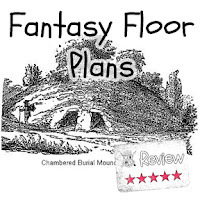 This item, Fantasy Floor Plans Tombs & Tumuli, is a short 8 page PDF file with four quick maps of paleolithic tombs that could be useful for a number of RPG genres. Included are some brief descriptions of the tombs and some flavor-text describing how the tombs might be used. This is a pretty straight-forward download that isn't bogged down with much more than what you see on the title page. The author/artist offers some free sample products and downloads for joining their mailing list, which is nice if you want more free stuff in the future.